No doubt, the end of hemp’s prohibition via the 2018 Farm Bill stood out amid the legislation’s plentiful pages. Farmers and industrial hemp stakeholders alike are now gearing up for next steps. According to an annual crop report from Vote Hemp, the foundation for rapid growth is in place. 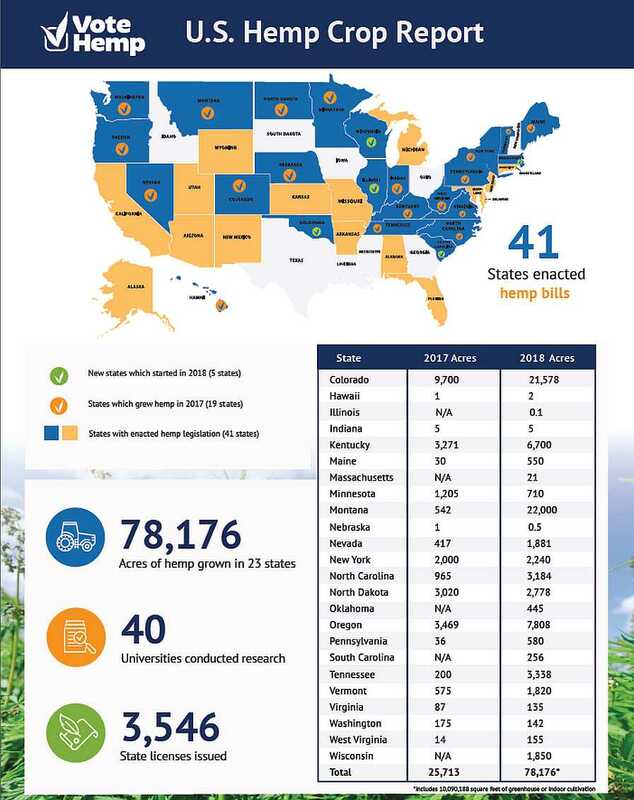 The latest report from the grassroots industry advocacy organization indicates nearly 80,000 acres of licensed industrial hemp were grown across 23 states in 2018. That figure was up nearly three-fold from 2017 and roughly eight times what was counted in Vote Hemp’s first crop report in 2016. Vote Hemp cites the cultivation data and other statistics are provided by state departments of agriculture. Where states were unable to provide data on the hemp acreage planted, the organization estimated at 70% of licensed hemp acreage. This estimate is based on data collected in other states that has shown an average of 70% planting rate. “Now that we have lifted federal prohibition on hemp farming, it’s time to invest our energy in expanding hemp cultivation and the market for hemp products across the country so that all can reap the benefits of this versatile, historic American crop,” stated Eric Steenstra, President of Vote Hemp, in a prepared news release. Industrial hemp – a variety of the Cannabis sativa plant — has multiple known useful applications, such as for building materials, plastics, food, skin products, pain relief, and more. As of this posting, 41 U.S. states have defined industrial hemp as distinct and removed barriers to its production. The following states are able to take immediate advantage of the industrial hemp research and pilot program provision, Section 7606 of the 2018 Farm Bill: Alabama, Alaska, Arizona, Arkansas, California, Colorado, Connecticut, Delaware, Florida, Hawaii, Illinois, Indiana, Kansas, Kentucky, Maine, Maryland, Massachusetts, Michigan, Minnesota, Missouri, Montana, Nebraska, Nevada, New Jersey, New Mexico, New York, North Carolina, North Dakota, Oklahoma, Oregon, Pennsylvania, Rhode Island, South Carolina, Tennessee, Utah, Vermont, Virginia, Washington, West Virginia, Wisconsin, and Wyoming. Would you grow industrial hemp on your farm? To review the full text of industrial hemp provisions in the 2018 Farm Bill, visit VoteHemp.com/2018farmbill.